I'll go for the obvious: Rusty. Who is judging? Santa himself will be judging this one, so bring your A game. Sid. The saw belongs to Terrence, though. Sid is trying to think of a way to return it without getting caught. Also, Hooray! I'm glad this qualifies as easy to do, because I love the name games. Fred. Fred the Red-headed Bed-wetter. But don't call him that--he's armed. Sawyer: He's the lead elf in the christmas tree division. Just. Just Because. Why is he named that? Well, I think you can answer that question. I just got Twelve Bots for $6 on Amazon! If only I could get lego kits to go with it. I'd pay $60 for that. Aaron. 'Cause he's Irish-looking. Maybe he's an immigrant. This is Myron, the little known half brother of Hermie the Dentist elf. He always wanted to be a general contractor, but he fell off the map before the Rankin Bass people came calling. He now lives in Pougkeepsie with his little wife and 12 children. His name is "Dextelf". The saw and hammer the tools of his trade. He rids the north pole of 'evil' that resides there with the help of his 'dark passenger.' He then sends the evil elf pieces into the deep, cold, narwhal filled waters of the north pole. Pipit. That name is STUCK in my head. he looks like a Brinton. He isn't actually good with tools. He plays the saw. Horray for the naming game! His name is Edwin or George. Billy, totally Billy, can't have Santa's Workshop without a elf named Billy. Yay! I liked the twelve bots, but these elves should be really fun. Glad you're back on the blog and hope those deadlines don't creep up too fast! I think this guy should be named Ronald. He wanted a delux buzzsaw for christmas but got stuck with that little saw and is sad about it. He can't stay on task cuz he hears EVerrrything. He's nicknamed "Temper" for a good reason-watch that blade. 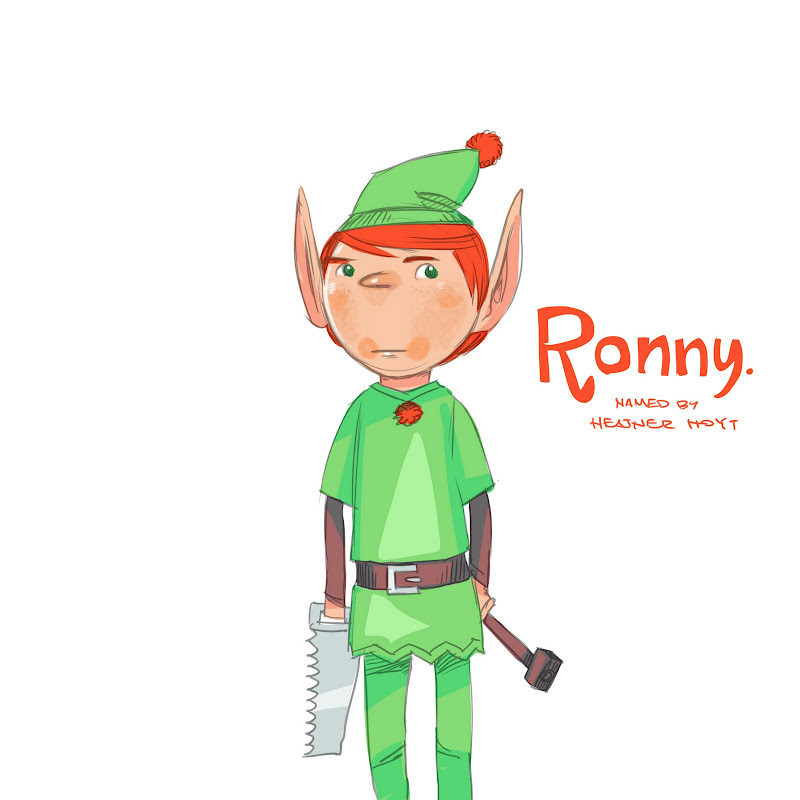 Robyn says: Puck the Mischief Making Elf - get those tools out of his hands! I just wanted you to know, 12 Bots of Christmas is now one of my stand by Christmas book picks for my library story times. The kids LOVE it -- especially when I go all opera singer with the 5 BOT-O-RIEEEEEES! And I have a blast reading it! So thanks!